Another round of badass boss babe inspo for you! It’s short, sweet, and to the point. And it’s something you need to know, too. 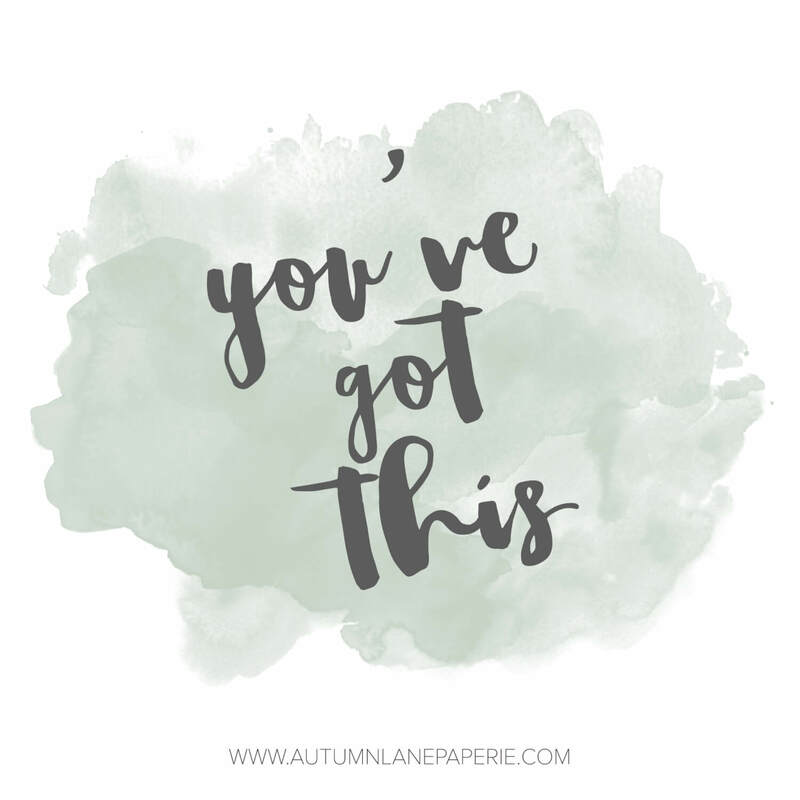 This lovely affirmation is clickable — download it and post to your social media, and encourage everyone else — they’ve got this, too! You can also click here to download! This is one of three fonts in the Fabs and Stylish family. I fell in love with this family the second I saw it — it’s so funky & trendy. Fily, the designer, is an absolute doll, too, so it’s even better that I get to support a super sweet business owner with amazing talent! I think there’s a ton of truth in that. Making mistakes is sort of life, ya know? I think that sometimes, mistakes are embarrassing, but most of the time, a mistake is simply a way of learning what *not* to do next time. I also think that this is a good way of saying that you should be prepared and ready for a mistake, especially if you’re trying something new. The thing is, there’s nothing wrong with making a mistake or not being perfect. If we were perfect, we would never progress and push ourselves further. So, please feel free to snag this downloadable graphic! It’s sized perfectly to share on your social media… in fact, I’d love for you to share this on your social media. Encourage your fellow badass boss babes, why don’t ya? Simply click the graphic to download, or you can click here. The lovely sans font is called Athens, from Jen Wagner Co. This font has become one of my regulars! I love a tall, skinny sans. And, I think it’s amazeballs that it comes in multiple weights. The cursive font is called Lemons Mangos Sunshine by the super sweet Emily Spadoni. I’m a big fan of Emily’s work, and this particular font is one of my absolute favorites she’s ever done. The swashes are so gorgeous, and the entire font is super versatile. Here’s a little badass boss babe inspo for you today: be fearless in pursuit of what sets your soul on fire. Isn’t this amazing? I think it’s the perfect reminder for a business owner, plugging away at what they do. We’re all in business for a reason, right? We started businesses because it made us happy. The day-to-day aspects of business can really zap you of your passion if you let it. Sometimes, I think that we even get “stuck” in what is working and keeping things afloat that we forget to keep charging forward for those things that set your soul on fire. New ideas, new concepts, new additions are all things that you should be fearless about. Don’t get too comfortable or complacent — be fearless, and constantly seek out more. I think that fear — especially fear of failure — keeps us from realizing our fullest potential and greatest joys. Feel free to click on that image over there, download it, and share it to your social media to encourage other business owners & dream chasers — hashtag it with #autumnlanepaperie and feel free to tag me, too! You can also click here to download the image! The ever talented Sam Parrett designed Crystal Sky, and you can find Bravery here, by Pollux of Geminorum. Pretty deep, eh? Maybe 2016 was rough on you in your personal life, or maybe business didn’t do as well as you’d hoped. You’ve got two days before the calendar swaps to 2017, and if you’re like the masses, you probably feel like you need to make some sort of resolution for a fresh start. Just like Mr. Bard said, you can’t go back and start over. But, you can start now to work toward the end goal you desire. What goals do you have for 2017? Want to know what goals your followers have, too? Click the graphic to download, and PLEASE share on social media! You can also click here to download! Happy sharing, and best wishes for 2017! Hello Beautiful by Nikki Laatz can be purchased from Creative Market. Hello Beautiful is an excellent typeface duo with some pretty badass options! It’s the perfect mix of edgy & feminine. You’ll never be great without taking a chance. How freaking amazing is this for some badass boss babe inspo? This comes from a song from the band Shinedown. They’re amazing live, just in case you were wondering. This graphic is the first of many to come, because I think that we all need a push every once in a while to pursue what you love, and love what you’re doing. Sometimes fear is nasty, and it holds us back from doing what we’d like to do. In fact, I can attest to it personally. I took a chance launching this business, wondering if it would even be a thing I could stick with or if I would be able to consistently have clients. There were days that I didn’t think I should do it because if it failed, I’d look like an idiot. Autumn Lane Paperie wouldn’t be what it is now, though, if I didn’t take a chance. I’ve already proven to myself I can do it once, so why not again? And you know what that means? If I can do it, you can, too! If you click on the graphic, you can download it and use it on your social media — feel free to post to your Facebook or Instagram, or pin it. 🙂 You can also download it here! Madina by Sam Parrett is such an incredible, versatile font — one of the most requested fonts when I’m designing!